NETWORK FINALS: BLINDSPOT lost 0.1 in final numbers. In addition, probably due to sports preemptions, the CW line-up was down across the board, by 0.2 at 8PM and by 0.1/0.1 at 8:30PM and 9PM. CABLE HIGHLIGHTS: ESPN’s afternoon coverage of THE MASTERS led Friday cable at 0.57. 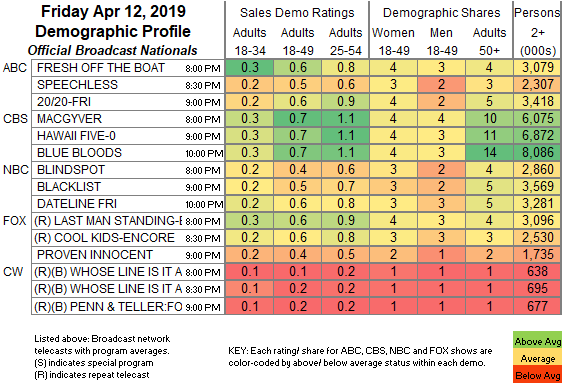 A&E’s LIVE PD fell 0.11 to 0.56, with the lead-in clip show down a tick to 0.29. On Discovery, GOLD RUSH lost 0.05 to 0.31, with the lead-out hour down a tick to 0.29. HGTV’s MY LOTTERY DREAM HOUSE eased by 0.02 to 0.30. On We, MAMA JUNE: FROM NOT TO HOT gained 0.02 to 0.25, and BRIDEZILLAS was up 0.03 to 0.14. Food Network’s DINERS, DRIVE-INS & DIVES rose 0.03 to 0.25. On ID, IN PLAIN SIGHT was at 0.24/0.24. 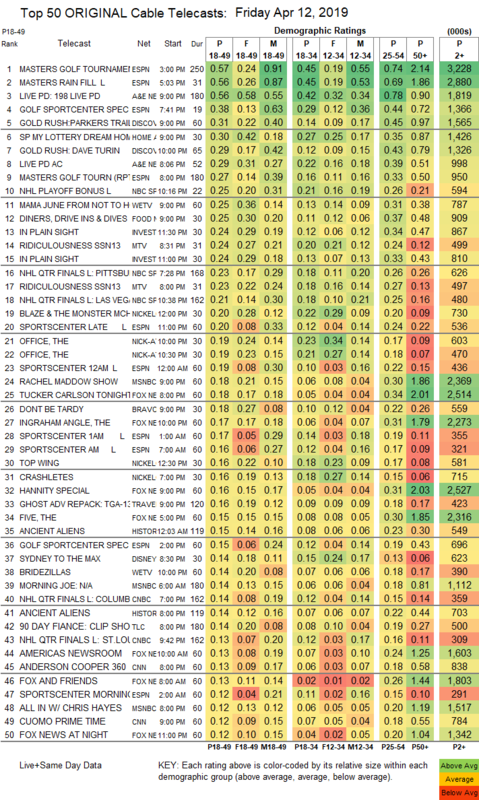 MTV’s RIDICULOUSNESS was at 0.24/0.23, compared to last week’s 0.22. NBC Sports Net’s NHL PLAYOFFS games were at 0.23/0.21, while CNBC’s games were at 0.14/0.13. Nickelodeon’s noon BLAZE & THE MONSTER was at #19 with 0.20. It was a cable news tie in 18-49s with MSNBC’s RACHEL MADDOW SHOW at 0.18/0.30/2.4M and Fox News’s TUCKER CARLSON TONIGHT at 0.18/0.34/2.5M, with CNN’s ANDERSON COOPER 360 at 0.13/0.18/800K. Bravo’s DON’T BE TARDY ticked up to 0.18. Cinemax’s WARRIOR stayed off the chart, steady at 0.03/114K. Warrior on Cinemax numbers, please. Looks like there’s a (temporary?) messup with the chart. It’s listing the top 40 and using the old format from back then. FYI, the timing and format of posts are likely to be a bit uneven for the rest of this week. Thanks for the heads up. Must be a busy week. Do you need a new spreadsheet? I’m great with Excel (beam!) and I’ll create one for you. I only need some sample data and any tweaks you’d want. Real Time with Bill Maher? Didn’t see it on TVBTN either, Nielsen slip-up?